Samsung starts rolling out the latest Android 6.0.1 Marshmallow update for Samsung Galaxy Tab S. The update is an Official Marshmallow which rolls out in phase wise manner. The update is rolling out via OTA (over-the-air) and many users already getting Android 6.0 marshmallow update for Samsung Galaxy Tab S. But for those who still don’t receive the OTA update, so we provide the Marshmallow OTA file for Galaxy Tab S with that you can Update Samsung Galaxy Tab S to Marshmallow Manually. Samsung Galaxy Tab S Marshmallow update is currently rolling out only in Germany (SM-T805) and will available for other regions soon. You can wait for the OTA updates, or you can Update Samsung Galaxy Tab S to Marshmallow manually. The new Marshmallow update packed with features like Now on Tap, Doze Mode, New App Permissions and more. The OTA file provide below is only for Germany Galaxy Tab S SM-T805, so don’t try it on other devices. The Android 6.0 Marshmallow update for Samsung Galaxy Tab S available via OTA (over-the-air) and it is about 1.41GB in size. Check below steps to Update Samsung Galaxy Tab S to Marshmallow Manually. This method is only for Samsung Galaxy A7 SM-T805 (Germany) only don’t try it on any other model. It will not erase your data but it is advisable to take a complete backup of your phone for safer side. Download and install Samsung Galaxy USB Drivers. 1) First, enable USB debugging from setting. 2) Download official Android 6.0.1 Marshmallow for Galaxy Tab S from above and Unzip it. 3) Download the latest version of Odin from above and unzip the zip file. 4) Run the Odin_v3.10.7.exe file on your PC. 5) Now Boot your Galaxy Tab S into Download Mode by press and hold ‘Power + Home + Vol Down‘ buttons. 6) Once you enter into Download mode, you see an ID: COM port turned blue and Added message in Odin message box means your device has recognized by Odin. 7) If ID: COM doesn’t show means your driver is not correctly installed or try it with different USB cable. 7) Now locate and add the firmware ‘.tar‘ file (you downloaded from above) to the AP/PDA tab in Odin. 9) Now click ‘Start‘ button and it will start flashing the file. Wait until you see ‘Pass‘ in Green Color on Odin screen. 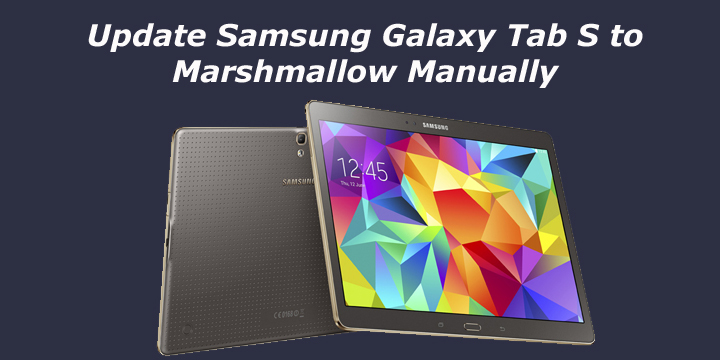 That’s all this is the complete guide to Update Samsung Galaxy Tab S to Marshmallow Manually. Let us know if you have any questions by comment below.